Radio waves are a type of electromagnetic radiation having frequencies from 300 GHz to as low as 3 kHz. An FM radio or a Frequency Modulation Radio is a radio which catches the radio wave signals in the air and converts them into electrical signals which can be interpreted by the FM / radio receiver IC. The IC demodulates the audio signals from the carrier frequency and passes the audio signals to the speaker. 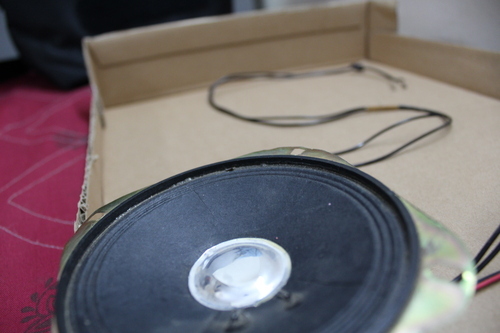 The speaker then converts these signals into sound of audible range which we can hear and enjoy. Antenna converts Frequency signal into electrical signal.The signals caught from the antenna are passed on to the FM/radio receiver IC (CXA1619BS) which does signal amplification and quadrature detection(phase change). This IC usage is generally preferred as it works at low voltage quite efficiently. The current then passes through variable capacitor and inductors (Tank Circuit or LC oscillator) whose key role is to tune the frequency so that required frequency gets acquired. Further the tuned signal(current) is passed onto a variable resistance.The work of variable resistance is to drop down the voltage of the current of different frequencies accordingly, so that the process of amplification happens smoothly. 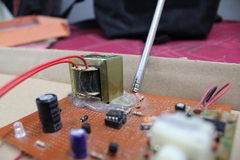 Moving further the current is amplified using two transistors n-p-n and p-n-p and an Amplifier IC(UA741CN) which helps in noise reduction and accuracy amplification of low level signals. Transistors are also primarily used as Amplifiers. The voltage supply is given to transistors through the step-down transformer. Before giving voltage across the transistors, the current is passed through resistances to ensure that there is a proper voltage drop. After passing through the amplifiers, the amplified voltage(signal) is passed on to the speaker(output device) to which a capacitor is attached to maintain constant voltage across the speaker and hence the speaker operates on the tuned frequency. Refer to given circuit diagrams inside an FM radio receiver. First on a piece of paper, draw a neat circuit diagram of all the connections to be made. You can find one attached down below but you must draw your own circuit for better understanding. Check individually that all your IC's are working properly. 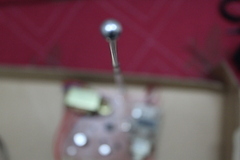 For the antennae, a long wire can be used. You will also need an FM receiver IC, the one we are using is CXA1619BS. You can either make all connections to this IC or simply buy one with the connections already made. We chose the later as it was available to us from an old non-working radio set, to avoid complications. For the amplifier IC, you can use UA741CN IC in your circuitry. Now, we come to the setup part. 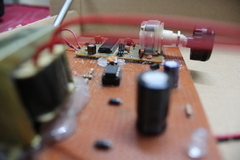 Follow the following instructions carefully to build your FM radio. Take a base on which your radio will be built. This can be a wooden plank or any piece of cardboard. Next, since the connections need to be neatly set up, you may want to use a connection board or a breadboard to make your connections on. Obtain a connection board on which your IC's and equipment will be placed. 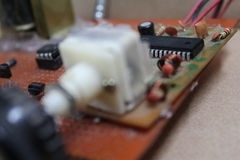 Place the various equipment carefully with reference from the circuit diagram on your connection board. 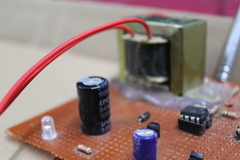 Connect the FM receiver IC with the with power source for power and to a variable resistance. The amplifier IC is connected to the 2 transistors used(see circuit dig). Lastly, solder all connections as shown in the circuit diagram to make your own FM radio set.